Chair Cover: Height 76", width 82". includes 29" on each side for arm rest. Total sitting area is 24". Loveseat Cover: Height 76", width 104". includes 29'' on each side for arm rest. Total sitting area is 46". 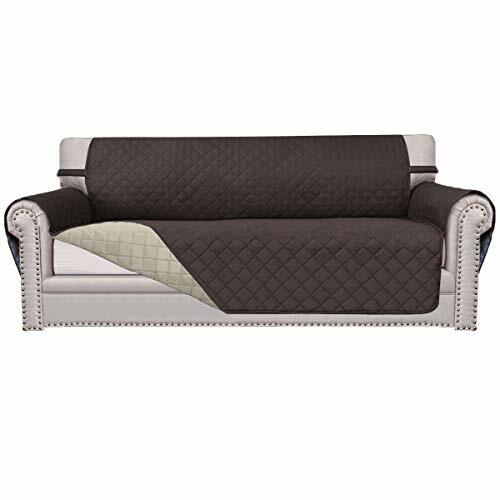 Sofa Cover: Height 76", width 124". includes 29" on each side for arm rest. Total sitting area is 66". Recliner: Height 85 ", width 77", includes 29" on each side for arm rest. Total sitting area is 19 ". Please measure before purchasing; See measuring guide in photos for a list of all measurements. Reversiblequilted furniture cover for double the use. Two color options (one on eachside). Easily match your decorative style. Gives a fresh look while protecting furniture against stains, wear and tear or pet fur. 2.Machine washable in cold water. Wash separately at gentle cycle. Using mild laundry detergent. Tumble dry with low heat. Do not bleach.